On these frigid days, it helps to think about a place like Antarctica, which was recently determined to be without a doubt the coldest place on Earth (as if anyone was really surprised?). But it's also home to unique historic monuments befitting the treacherous environment that include 100-year-old huts, industrial tractors, and even one nuclear power plant—but, often, they're literally just a pile of rocks. There are 85 sites currently dubbed a Historic Site or Monument (HSM) based on their importance to exploration, science, or "feats of endurance" (which sounds like an episode of Double Dare). But unlike other monuments that have been denoted and approved by a city, state, or national government, these sites are landmarked by the Antarctic Treaty System, a set of international agreements that govern and protect the continent. Monuments are proposed and approved at annual meetings of the Antarctic Treaty Consultative Meeting (ATCM), a multi-national body of scientists and other experts who determine the importance of the sites. Sometimes plaques are produced and placed at the sites to mark them, but it's not much of a problem in a place where wind or snow and maybe the errant penguin are the only things likely to disturb a site. One of the most recent monuments to be added is a circle of rocks that is assumed to have held down tents at the campsite of Captain Robert Falcon Scott's Terra Nova Expedition. They've been there since December 1912. Don't think these places are off-limits, though. Tourists can actually visit a few of the more accessible sites. Here's the complete list [PDF] and a few of our favorites. A group of Norwegian explorers led by Roald Amundsen reached the South Pole on December 14, 1911. They left their tent and its Norwegian flag to signify to future expeditions that they had made it there first. The tent is now permanently buried beneath the snow. Photo by E.W. Searle. A wooden pillar and plaque lists the names of the first French expedition to Antarctica led by Jean-Baptiste E. A. Charcot, who build this cairn there in 1904. The cairn is on a hill on Booth Island, and visitors can hike to see it [PDF] as long as they don't disturb the nearby penguin colonies. Photo by Serge Ouachée. A few seal bones and this wooden plaque are all that mark the site of a melted ice cave which was constructed in March 1912 by the Northern Party of the British Antarctic Expedition. They were forced to spend their winter here when their boat didn't come to get them. Photo by M. Murphy. This hut built in January 1911 by Captain Robert Falcon Scott's expedition is one of the only Antarctic sites to be restored and maintained (mostly to keep it from being covered by snowdrifts) and is listed as a specially protected area (ASPA). You can even visit it on Google Street View. New Zealand archeologists continue to excavate the site, where they recently found 100-year-old frozen butter, among other artifacts. Photo by Emilio Flores. Yes, that is indeed a bust of Vladimir Lenin, along with a plaque to honor the Soviet Union's expedition to the "Pole of Inaccessibility" in 1958. Photo by Cookson69. A bronze plaque marks the former site of the PM-3A nuclear power reactor, seen here in 1965. After being plagued with problems that might have originated from building a nuclear power plant in subfreezing temperatures, the plant was shut down in 1972. Because you can't leave nuclear waste on Antarctica, the entire thing was shipped to San Diego where it reportedly gave naval workers cancer. Photo by U.S. Army Engineer Research and Development Labs. The Chilean meteorological base at Pendulum Cove on Deception Island studied volcanic activity in the area until it was destroyed by volcanic eruptions in 1967 and 1969. You can see the lava flows which swept into the bay. Photo by Jorge Valdés Romo. 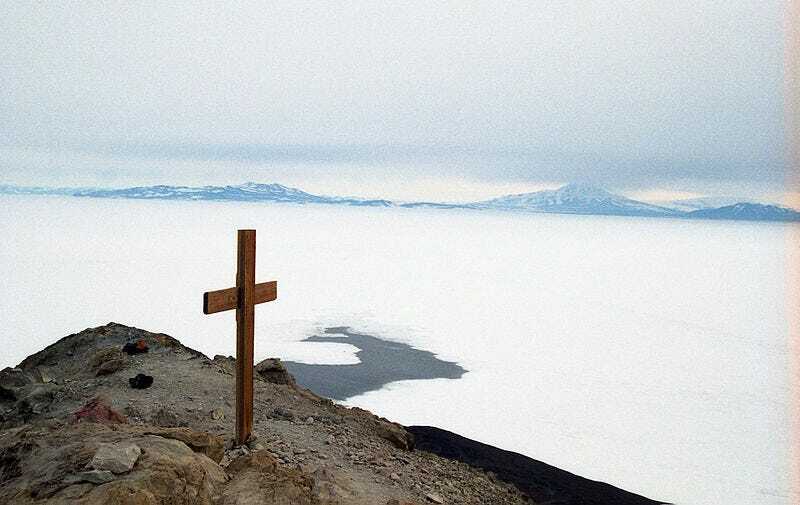 Top image: A cross on Ross Island was built in January 1913 by British explorers to honor the members of Captain Scott's team that died on their way back from the South Pole, including Scott himself. Photo by Barneygumble.